Salt Spring made a clear choice in local government elections Saturday, choosing Gary Holman, Peter Grove and Laura Patrick by a strong margin. Holman was the undisputed winner in the race for CRD electoral area director, receiving two-thirds of the votes cast, or 2,307 compared to 1,158 for opponent Robin Williams. The choice for two Islands Trust trustees was similarly clear. Patrick earned more votes than any candidate with 2,324, while incumbent Grove found support from 1,937 people to continue his role. The next closest of the six trustee candidates were Kylie Coates (717 votes) and Darryl Martin (705). Howard Holzapfel received 536 and Sabrina Ali 398 votes each. 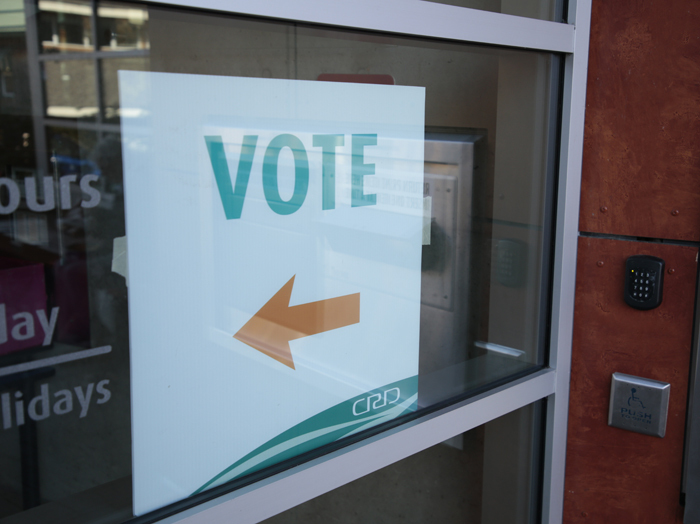 Results include advance polls, mail-in ballots, and votes from off-island polls at Richmond Secondary School, Mary Winspear Centre and Piers Island. Holman said Monday that he was “stunned” by the result, since in his past experience as a politician the race has usually been a lot closer. “I’m pleasantly surprised and very grateful for the support I received,” said Patrick, who also sees a wish for unity, collaboration and problem-solving as strong motivation for voters this year. “I think as islanders we have so much more in common than we act like sometimes. There is a real desire to find and build from those areas where we can agree, and I think we agree on a lot,” Patrick said. Grove said he was very pleased to be re-elected for a third term and to see voter turn-out improve. He feels some of the extra interest probably comes from the important issues the community is facing, of which housing has become most prominent. The three elected officials had already scheduled a meeting on Monday to talk about how to tackle housing and governance matters as soon as possible. Grove said from the Trust’s side, there is not much that can actually be done to further affordable housing stock, but he promised to do whatever is possible, while still keeping water supply and climate change issues in sight. Regular, integrated public meetings will help the three officials to work together. Patrick observed the island’s problems are weighty ones, but said the election suggests there is willingness to work on them across community divisions. “We have to set the example, and we’re setting it for all the other organizations on the island. It kind of radiates from us,” she said. As the unsuccessful candidate for CRD director, Williams said he was not disappointed and that he wished Holman the best. However, he warned the problems he sees with the senior CRD staffing structure may only get further entrenched. “From my perspective it was a very important election. The community had two choices: ‘Are you happy with the status quo, or do you want someone to do a managerial review?’ That was asked, and they chose the status quo,” Williams said. Williams currently serves as chair of the Salt Spring Transportation Commission and intends to stay in his role until the end of the year, when his second term expires. After that, though, he does not plan on being involved in any CRD commissions. “I would not want to stay on in an organization in which I’m held accountable by the community for the actions of staff, yet I have no authority over their actions,” he said. For his part, Holman said he is aware there are frustrations among commissioners and from community groups that would like to work with the CRD. He is a member of the Liquid Waste Commission, whose members resigned en masse several years ago. Holman said he plans to have informal meetings with all the different commissions before the end of the year. “I know there is dissatisfaction about their relevance, particularly some of the water commissions,” Holman said. “There’s some question about how relevant they are — they feel they’re not meeting enough and they don’t have enough input into key decisions. Voter turnout improved from 2014, a low-issue year when voters were content to re-elect a full slate of incumbents. An estimated 38 per cent of the 9,115 eligible voters went to the polls this time. Of that total, 8,245 were resident electors and the rest were non-resident property owners.